Every year during the first week of October a little bit of magic happens in Albuquerque, NM. For 9 days the city’s already enchanting skyline is dotted with hundreds of hot air balloons during the Albuquerque International Balloon Fiesta. 2015 marked the 44th year of the event, which has grown from a humble 13 balloons in a mall parking lot to nearly 550 balloons from 17 countries this year. It’s the largest ballooning event in the world, attracting hundreds of thousands of spectators (an estimated 955,703 in 2015), and is also credited as the “most photographed event in the world.” Throughout the week visitors can attend the trademark early morning Mass Ascensions, evening glows with music and fireworks, Special Shape Rodeos that showcase balloons ranging from a giant cow to a pirate ship and even Darth Vader, as well as other events and flying competitions in between. You can head over to the Balloon Fiesta’s official website for all of the details. So why Albuquerque? The city is ideal for flying this time of year thanks to the fall’s clear days and cool morning temperatures, as well as the semi-predictable, box-like wind pattern that is formed between the Sandia Mountains and Rio Grande River Valley (a phenomenon called the “Albuquerque Box”). 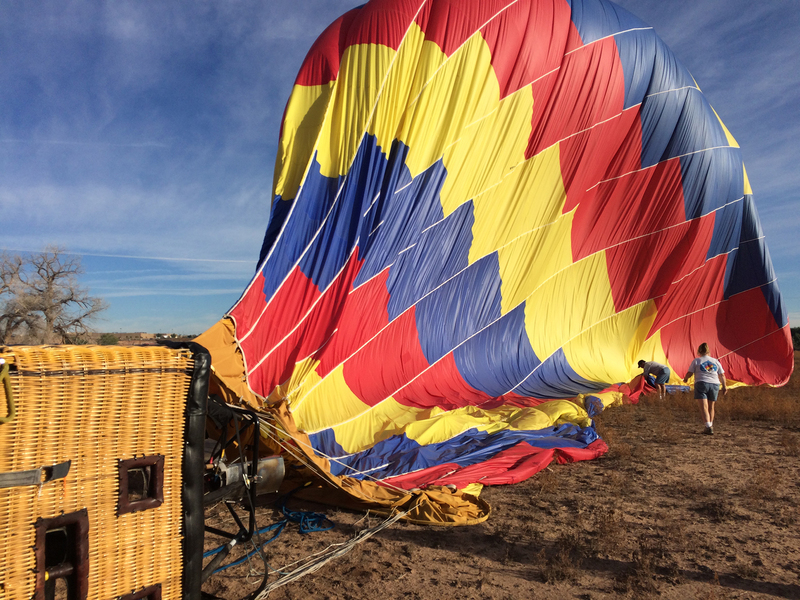 Each morning a select handful of balloon called Dawn Patrol launch to test the weather and air conditions above. Once they give the ok, the balloons on the field start to inflate and take off in waves from their numbered spots on the ground, creating a kaleidoscope of color in the sky. I’ve attended the Balloon Fiesta many times, but this year I had the opportunity to actually go up in a hot air balloon. The view was stunning to say the least. As the sun began to peek over the mountain tops and illuminate the dawn sky, we peacefully floated high above the lush green river valley below with fellow balloons drifting around us in every direction. Even though it’s the most photographed event in the world, pictures don’t compare to witnessing the Balloon Fiesta in person. 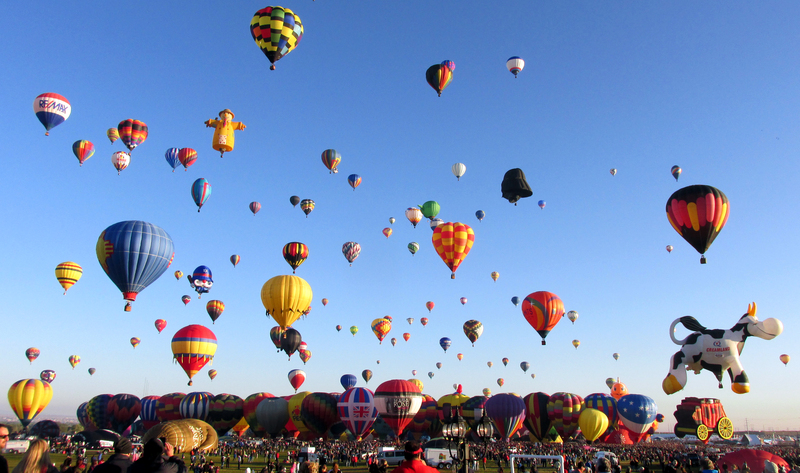 Plan and book in advance – given the Balloon Fiesta’s popularity, flights and accommodations in Albuquerque can sell out, with prices increasing as the event gets closer. Pack and dress in layers – while morning temperatures are often in the 40s (think coat, hat and gloves), afternoons can be sunny and in 70s (short sleeves). Also, even if the early morning feels moderate when you first arrive at the balloon park, temperatures will typically drop at least 10 degrees when the sun rises before they warm up again. You’ll also want to have good, sturdy shoes for walking on the dirt and grass field. Arrive at the park early – this year’s massive crowds meant long lines into the park, so definitely allow plenty of time to get there. Luckily that means more time for the city’s beloved breakfast burritos with coffee or hot chocolate as you browse the sponsor and vendor booths. Also worth getting up early for is a warm and sticky Frontier Sweet Roll. Watch out for zebras – not the wild kind, unless you are talking about their often crazy choice of headgear and eccentric accessories. The people you see on the field dressed in black and white stripes (and wide awake at 6 a.m.!) are the event’s “referees”, directing balloon traffic so the crowds and pilots know when it’s time for takeoff. Get up close and personal – one of the best things about the Balloon Fiesta is that spectators can have participating role. You are free to walk the field as the balloons set up and inflate, and you never know when you might be recruited by the crew to help. Also, pilots usually have trading cards for their balloons (perfect for kids) if you walk up and ask. This is such a cool festival! Although I’m a bit afraid of heights, I’d love to see it from the ground ;) I can clearly imagine why it’s the most photographed event! Excellent pictures and commentary as usual, Jessica!!! So glad to see you doing the Balloon Fiesta up right for your blog. I also love that it’s a Fiesta for all the senses, the sights, smells and taste of the food, sometimes you get to touch if you’re helping…and the Sounds, like dragons breathing fiery life into the balloons! Thank you Suzette! You’re so right, it really is a feast for the senses, and I love the fire breathing dragon analogy. Such a vivid way to describe it! I love the photos, especially the first one. Don’t know if I’d be brave enough to go up but it looks awesome! Thank you so much! The strange thing about flying in a balloon is how calm and serene it is up there. Although it’s pretty amazing from the ground too as all the balloons start to go up around you!